"Li-ion cannot absorb overcharge, and when fully charged the charge current must be cut off. A continuous trickle charge would cause plating of metallic lithium, and this could compromise safety. To minimize stress, keep the lithium-ion battery at the 4.20V/cell peak voltage as short a time as possible. Once the charge is terminated, the battery voltage begins to drop, and this eases the voltage stress. Over time, the open-circuit voltage will settle to between 3.60 and 3.90V/cell." So is this in stock since its got the green dot and says there's 2,771 in or are we still to assume it is discontinued with no replacement??? I'm wondering if it is possible to draw some current from the Li-ion battery to power my circuit while this chip is charging it. Is there any problem doing that? Yes you can draw current with your circuit while the battery is Charging the max1555 is made for this purpose. will not charge but drain. battery voltage level as well. In past designs it was not allowed to have a load attached to a LiPo battery under charge because the charger is looking at current draw during the pre-charging and charging phases and voltage during the terminal phase. Having a load attached and drawing current made these measurements difficult and interfered with the charging process. Is this still not true for the MAX1555? Is there a document that describes the 100mA limitation? Thanks! If you take a look at the datasheet it will mention that charging is limited to 100mA if connected to a USB supply, and 280mA when power is applied to the DC pin. I do not know where Dirk got the 350mA limit from. Concerning drawing current while charging. I do not know if this is possible, but the typical application does seem to suggest that this is possible, as the schematic notes "To system load" and not "To battery", tho I too seem to remember that there might be some issues with that. With system load they could of course mean the load of the chargin chip, being the battery, however that would be quite silly labeling. You could just power your circuit from the power source that powers the charger. That would be a slightly harder circuit to build but it shouldn't complicate things too much. So, here's a question about this IC: can I use it to charge ANY Li-ion or LiPo battery? For example, I picked up some DEWorld batteries from RadioShack, which have a PCB protection circuit built-in. Can I safely charge such batteries with this IC? can this charge a lithium-ion coin cell battery like those found in some laptops? Referencing the datasheet the quoted max USB supply current is 3mA with a max voltage input of 6V. How is it then possible that the output is 4.242V at 100mA (at max charging)? This parameter does not seem to make sense with basic rules of electronics and power and when examining the circuit in the data sheet it seems as though the FET draws the current directly from the voltage source. If I am just reading the data sheet incorrectly please inform me but otherwise if anyone has an answer to this question it would be greatly appreciated. I'm thinking a dime might have been a better choice for scale. ok so I got it soldered on my board. I am 99.999999999999999999% sure everything is soldered together in the way it needs to and that there are no short circuits. My chip starts making smoke when I plug the battery that will be charged into it. The battery is an 18650 cell. What am I doing wrong? Speak English with the battery!!!!! 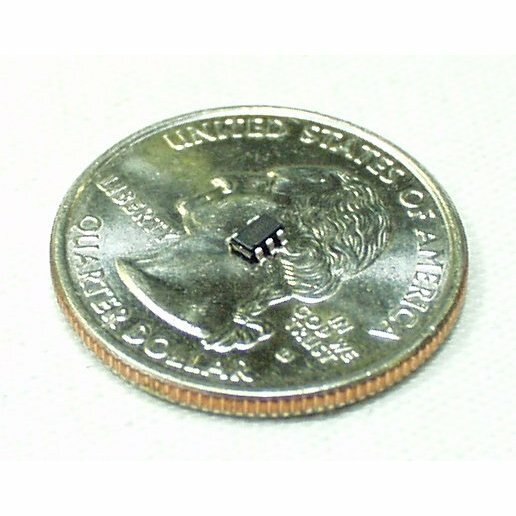 How are we supposed to attach this tiny tiny thing to our pcb board? I have had no luck. Can anybody help? If you are trying to solder it on solder pads on your PCB board, then I recommend solder paste. You can also use thin solder. If you are just trying to add this to your setup, I recommend taking a look at our SOT23 to DIP Adapter in the related section, because it makes the IC easy to connect to your setup. If you give more specifics to your setup/PCB board you are using, I can give better tips! Are there any chips similar to this that can charge a 2 or 3 cell battery? You should stock it's big brother, the MAX1811. It's good for a lot more mA. Could we get a picture of something other than a coin? Update: I didn't look close enough to see the tiny ic! Is it possible to charge two Li-ion button cells in parallel with a single MAX1555? Kinda sorta, if the cells are balanced and have similar internal resistance then maybe, but I wouldn't try it. I just want to ask: is it possible to charge a Li-ion battery of 7.2V?? Is there any problem doing that?? No, these will only charge single-cell LiPo batteries. Single-cell battery is an oxymoron. I usually just refer to them as lion secondary cells or just lion cells. Sorry for being a grammar nazi. lipos are pretty commonly referred to this way. a single cell is 3.7v. As far as I can see, the datasheet does not actually mention any trickle charging after the main charge is complete. I'd like to know if this IC does in fact go into a trickle charge mode, and if so, what is the trickle charge current? I want to use it to maintain a back up battery, so external power will almost always be present. I don't want to wreck the lithium cell by continuing to trickle charge it. If you know the answer, please share it ! Thanks. The device does not trickle charge when the main charge is complete. That is a major error in Sparkfun's description. Li-poly batteries should NEVER be trickle charged. They will be overcharged then and die. If you wish to maintain a full charge it's best to wait for the battery voltage to drop a reasonable amount and recharge. This may be a while as lithium batteries are better than other types in holding a charge with no load attached. This charger also does not seem to do a saturation stage when the full voltage is reached. This means this charger will only charge batteries to about 85% of their capacity. I want to use this with the 900mA li-po SparkFun sells. Is it reasonable to assume that from usb(100mA) that it takes approximately 9 hours to charge? I figure the battery will still have some juice but it won't charge at 100mA the whole time either. I'm just looking for an approximate charge time with this chip. I'm working on a battery powered setup, but I want to run the uC at 5V, since the sensor I'm using also takes 5V, and the display will probably need the same 5V. Can I safely use this charge IC, which would then connect to the battery, and also connect to a DC-DC step up converter or would there be a feedback loop or anything giving me an unwanted result in the charge circuit? There most likely would as the first post in the comments above shows, the amount of current needed would overload the chip in most cases. Is it possible to charge a single cell 3.7V Li-Ion battery (for example http://www.sparkfun.com/commerce/product_info.php?products_id=341) with this chip? Any consideration about using this chip? For the other modules, see the SFE charger in Related Products below. It uses this chip. It has to be to be safe. If the voltage floated upwards, you might end up with a very high voltage being shocked into the cell when you connect it, which given how sensitive lithium batteries (and the often built in protection circuits) are might be a nightmare.